Starting an art business is a long, and involved process. Especially when you also have to work a full-time job whilst trying to get it off the ground. When you factor in that Craig and I are introverts by nature, well . . . let’s just say that we’re not great at walking into a business and asking if they want to hang up our art. But earlier this year, I did just that. I happened to be in our local library and noticed a sign that talked about art exhibits at the library. A spark inside prompted me to ask about how I could become one of the artists that shows work in the library and–after sharing some of our work–was very quickly invited to put up our art any open month in 2014! July and August were available, but Craig suggested we take December, so as to give us more time to gather pieces and make them ready. His was a very good suggestion, and I’m glad we heeded it, because it really did take several months to be ready for this exhibit, but it’s here! It’s finally here! Craig and I are having our first solo art show at the library next month! I suppose it’s not technically a “solo” show, since we’ll both have images on display, but if you think of us as a company, then it’s definitely a one team gig. We do get our prints done through professionals, but since we’re still fairly new to this and don’t have a lot of income, we mat and frame all our own pieces. We have about 20-30 pieces that we’re putting on display, so you can guess just how many hours we put in for this show. There were days that we scrambled to make it happen (and believe me, there were a few mistakes along the way), but now that we’re just a few days away from the Gala Reception on December 3rd, it all seems totally worth it. And when I started to pass out the flyers to people I know, all the wonderful responses made it feel even more worth it. There are so many people who seem truly excited to come see our exhibit; some of whom didn’t even know we were artists. Upon learning that the two images in the flyer above were actually ours, one lady’s jaw even dropped, so impressed was she by our abilities. Craig and I are also in the process of renovating our website, and hopefully we’ll have lots of traffic on it during and after this exhibit, which may hopefully lead to purchases, which will help build our business. So, while it’s been a long road to get to this point, it’s starting to feel like the seeds we’ve planted are germinating and growing. And that’s a great feeling. 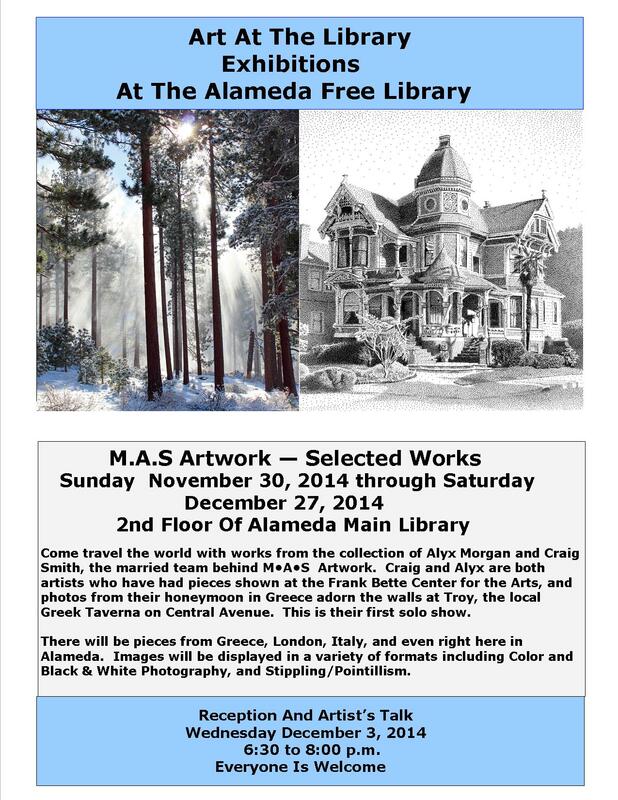 If you’re in the Alameda area during the month of December, please stop by and check out our exhibit. The address for the library is 1550 Oak Street, Alameda, CA. You can find their hours here. And if you can make the Gala Reception, even better! Craig and I will be there and will give a small talk about the pieces and our processes. We’ll display pieces that are on our website currently, but we’ve also got some new, lovely pieces that will be on our site shortly, once we’re done with the renovations.